Mira Stammers is on a mission to provide quality legal advice at an affordable price. And she is already making her mark in a tough market, thanks partly to help from the Small Business Mentoring Service. After working as a corporate banking lawyer for seven years in Melbourne and London, Mira decided Australia’s legal profession had room for improvement. “Access to the law needed to increase, as did affordability and transparency,” she says. The result is Legally Yours, which uses a team of talented lawyers to produce commercial legal documents and advice. 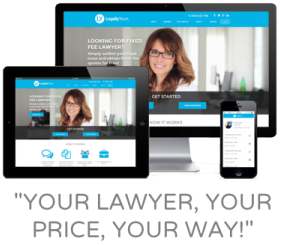 Its online brokerage allows clients to request fixed-fee quotes from lawyers at no cost. This provides the convenience of online comparison and telephone support to ensure a tailored experience. Most clients are Victorian small to medium businesses owners, often women, with up to 10 employees. Some are from NSW and Queensland. “Basically, if a business owner has a legal need, I assess their matter and connect them to a business lawyer who can provide a fixed-fee quote to them,” Mira explains. “All the lawyers that work with me are down to earth, highly skilled and pleasant to deal with. Mira started her business in mid-2014. She was confident her idea was good, but wanted help to determine its direction and discuss its viability. After hearing about SBMS while discussing the concept with a friend, Mira was matched with mentor Jamie Pearce. An experienced management consultant, Jamie has a particular expertise in coaching 'at depth' to deliver clarity, self-confidence and performance. He has extensive experience in managing and motivating individuals and teams from different generations. Jamie’s approach combines 'hard' and 'soft' methodologies to deliver clarity, self-confidence and performance. Jamie and Mira had three single SBMS sessions over nine months as she developed and established the business, with several phone discussions. Mentoring is continuing. Jamie says Mira is a highly intelligent lawyer with a great deal of drive and potential, so he only had to guide her. He helped provide clarity about what she really wanted to do and the changes involved in hiring staff. Rather than discuss the nuts and bolts, Jamie mainly helped Mira to reflect upon the type of business opportunity that suited her best. They discussed general strategies, marketing and which name would suit the business best. Jamie also boosted Mira’s self-confidence by pointing out what she was already doing right. “From wondering about what she might do, Mira has established a new type of business which has expanded very fast,” he says. Mira says her first session gave her the courage to believe in her idea and herself and pursue her dreams of creating a more affordable and transparent legal marketplace. After seeing Jamie, Legally Yours’ sales and new customers rose by about 30 per cent month on month. Profits have steadily increased and being clearer about her target market has helped Mira to build a better and more strategic marketing campaign, resulting in more leads. She was able to pay herself a wage after just six months, and is investing in IT. If things continue, she will soon hire staff to complement the contractors. Mira couldn’t be happier with Jamie’s help. “The mentoring helped me to be clearer about many areas of the business which in turn has seen the business achieve month on month growth,” she says. “I’ve certainly been grateful for the strategic discussions. Jamie helped guide my thinking and decide on a profitable path. Being a solo business owner, it was useful to bounce around ideas and get clear as to the direction of the business and the reasons for that direction. “Jamie has been a pleasure to work with. It’s amazing to look back at our first meeting and see the company from inception to now. The process of seeing a mentor in the early stages helps the business come alive because you start talking specifically about how it will look and operate.